OCTOBER 19—Hundreds of thousands marched in Mexico City on October 15 in defense of the SME electrical workers union, all of whose members were left jobless on October 10 when the government dissolved the state-owned company where they had worked. In addition to the numerous contingents of electrical workers in what was one of the largest mobilizations in the union’s history, there were contingents from many other unionized workforces, including miners and metal workers, flight attendants and pilots, transit and health care workers, and the UNT union federation. The electrical workers were also joined by large student contingents from the main national public university, UNAM, and affiliated high schools, as well as peasant and social organizations and thousands of others. Opposing the privatization of the electric energy industry, protesters demanded that the government decree be reversed and that the workers be given their jobs back. At the rear of the march was a contingent led by López Obrador (known as AMLO) and his followers, including from the bourgeois-populist Party of the Democratic Revolution (PRD), who, due to the massive attendance, were able to get to the Zócalo (central square) only after the rally had ended. The PAN [National Action Party] federal government of Felipe Calderón has launched the most brutal anti-worker attack of recent decades through the liquidation of the state-run Central Light and Power Company (LFC), throwing its more than 40,000 workers into the streets (with more than 20,000 retirees left in uncertainty). Last night, thousands of Federal Police and military personnel occupied the company’s installations as a preventive measure against the powerful Mexican Union of Electrical Workers (SME). The government is attempting to destroy the SME, one of the oldest unions with the most combative reputation in the country. Previously, the government had refused to recognize the elected union leadership by denying it the anti-worker “toma de nota” [procedure by which the government validates the election of new union officials] and had frozen the union’s assets. Bourgeois state: Hands off workers organizations! Justified in the name of increasing productivity and against “operational and financial inefficiency,” this attack will mean the elimination of labor gains obtained through decades of struggle by SME workers, and it will deal harsh blows to the already impoverished population in the center of the country through the eventual elimination of subsidies to the vital service of electric energy. The disappearance of LFC is a step toward privatizing the electric industry through the elimination of the main obstacle, the SME. Privatization would open the road to unbridled exploitation and would mean even greater subordination of the Mexican economy to imperialism. This new onslaught by the bosses is a savage attack against the workers movement and against all the poor. Defend the SME! Mobilize the social power of the working class—for labor strikes in solidarity with the SME! Down with the privatization of the energy sector! In going after a nerve center of the workers movement, this attack furthermore has the purpose of demoralizing and atomizing the working class as a whole. 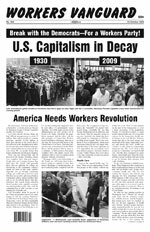 The victory of this onslaught would embolden the bourgeoisie in its reinforcement, already under way, of the repressive state apparatus—under the guise of the “war on drugs,” whose real targets are combative workers and left organizations—in the face of the devastating effects of the international economic crisis. According to the bosses, we should “all” tighten our belts. Indeed, the nature of capitalism dictates that the workers and peasants around the world must pay the price of the economic crises. It is necessary to destroy this system and replace it through socialist revolution and its international extension (especially to the U.S.), with an internationally collectivized and planned economy centered on the pursuit of satisfying the needs of the population. The government plans to use workers from the Federal Electricity Commission (CFE), organized by the SUTERM union [a corporatist union which organizes electrical workers nationally], to operate LFC. For decades, SUTERM’s venal corporatist bureaucracy has acted in cahoots with the bourgeois government and has adapted to the exploitative “productivity” ideal that the bosses want to impose on what was until yesterday the LFC. SUTERM workers: Don’t be scabs for Calderón—don’t replace SME workers! To fight effectively against this attack, it is necessary to combat the widespread illusions in the bourgeois populism of AMLO [former presidential candidate Andrés Manuel López Obrador], the PRD, and its appendage, the PT [Labor Party], all representatives of the class enemy who today pose as “allies” of the SME. The proletariat has unique class interests and enormous social power based on its role in the productive process; this means it is called upon to play the leading role in championing the aspirations of all the poor and oppressed through its own emancipation and the establishment of a workers and peasants government. The working class does not lack the will to fight; but as long as it remains dominated by the politics of bourgeois nationalist populism, it will be derailed towards illusions in the democratic reform of capitalism. The purpose of AMLO and his PRD is to perpetuate this system of exploitation and oppression.